Heartwood Landscaping & Tree Services, Inc. is owned and operated by a Longwood Professional Gardener Graduate, we are a well-established landscaping & tree service company in operation over 29 years. We offer a Health Care Plan and Paid Vacation for all positions. The safety of our team members is a key principle for us. To help ensure our workforce’s safety we drug test all applicants. Heartwood is seeking Arborists/Master Tree Climbers with 5-10 years of experience who have a passion for climbing and follow all safety standards. Must be highly motivated and able to climb trees 80-100’ tall without spikes. 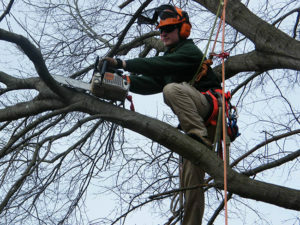 Must know proper pruning and cabling techniques, and have skills to remove trees safely. Must also have leadership and organizational skills needed to train and manage ground men and climbers, and get work done in a timely manner. Applicants need to have High School Diploma or equivalent, valid driver’s license with a good driving record and a positive attitude. Must pass DOT physical and pre-employment drug testing. CDL preferred; 40 hour work week; year-round work; 2 weeks paid vacation after first year, health Insurance after 30 days. Be part of a great crew that is team oriented! $45-60K+/per year, depending on experience. For this position, please email your cover letter and resume to manager@heartwoodlandscape. We are currently looking for a Tree Climber. Must have a passion for climbing and follow all safety standards. Must have a positive attitude and be willing to accept constructive feedback. Must be physically fit for climbing. Must be able to climb trees without spikes. Knowledge of cabling & lightning protection techniques is a plus but not mandatory. Ability to safely and efficiently operate bucket truck a plus but not mandatory. Can load and unload trucks with brush, debris, and landscaping materials. CDL Class B license is preferred but not mandatory. Must have reliable transportation, and a good driving record. Must be able to routinely lift 50 – 80 lbs. Must be willing and able to work outdoors year-round in both cold and hot conditions. Must be able to assist in snow removal and deicing. Must have reliable transportation, valid license, good driving record. Pre-employment DOT physical and drug test required. This is a year-round job that requires 40+ hours per week. Starting Compensation rate dependent upon experience: $16.00 to $22.00/hr. We are currently looking for an experienced Bucket Truck Operator Climber. Must have the ability to safely and efficiently operate bucket truck. CDL Class B license or greater preferred but not mandatory. Year round 40+ hours per week. high quality professional workmanship that excites our clients and successfully advances our company. We are currently looking for a Landscape Maintenance Technician. Must have knowledge of proper planting techniques for large trees. Must be able to dig holes, haul gravel, top soil and mulch. Must be knowledgeable in Grading, seeding and sodding. Must be able to routinely lift objects 50 – 80 lbs. Must be physically fit and have a positive attitude. Starting Compensation rate dependent upon experience: $14.00 to $16.00/hr. Heartwood Landscaping & Tree Services, Inc. is owned and operated by a Longwood Professional Gardener Graduate and is a well-established landscaping & tree service company that has been in business over 29 years. We are currently looking for a Landscape Construction Technician. Must be able to safely use a masonry saw and a 16” circular saw.